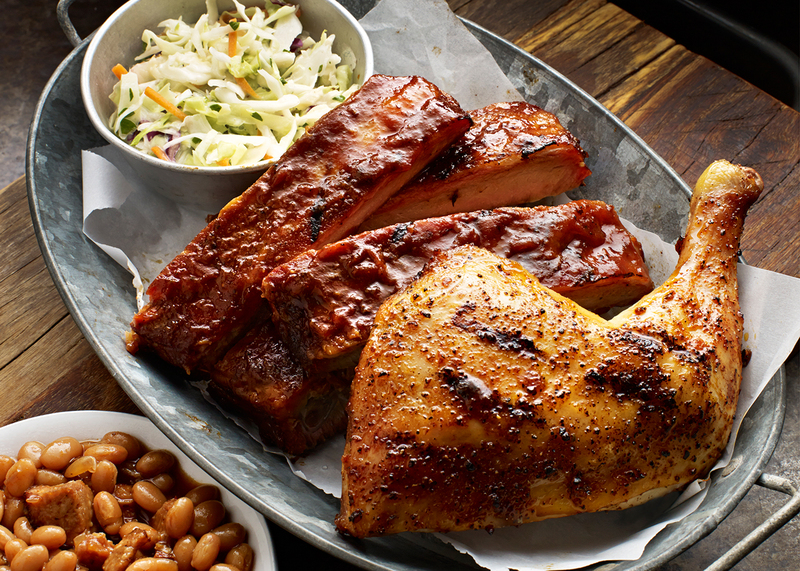 Two slow-smoked options: Original baby backs seasoned with our Chicago-style rib rub then sauced with Sweet & Zesty* and a touch of honey; or Memphis-style, rubbed with a secret recipe of herbs and spices, hit with a vinegar mop and served naked. Tender strips lightly-breaded wth Cajun-seasoned cornmeal and flash-fried. 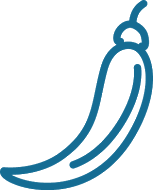 Served with remoulade sauce. 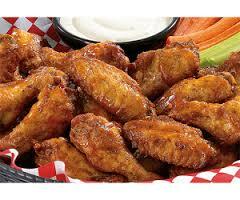 Dave's wings specially-seasoned and tossed in your choice of Rich & Sassy. * Buffalo or Devil's Spit* sauce. Tossed In Dave's special seasoning and served with honey BBQ sauce. The Pitmaster's secret. Tender pieces of Texas Beef Brisket seared end caramelized with Sweet & Zesty' BBQ sauce. 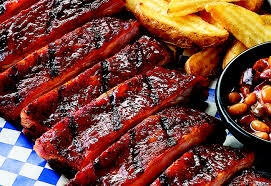 Choice of Buffalo'd Bones or Southside Rib Tips, Chicken Tenders. 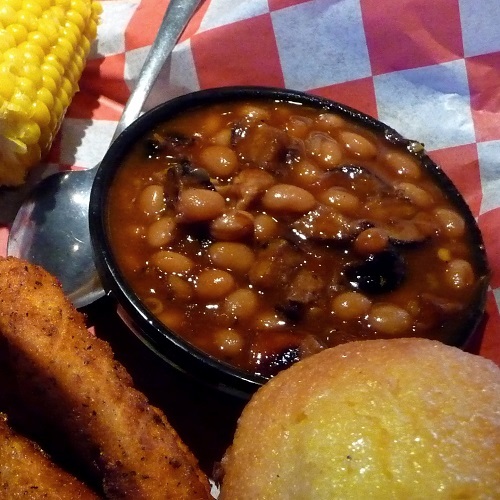 Sweetwater Catfish Fingers, Onion Strings and Traditional or Boneless Wings tossed In choice of sauce. Lightly-breaded and flash-fried served with remoulade sauce. A pound of Memphis-style dry-rubbed tips served with a side jalapeño pickled red onion, Hell-fire Pickles and our Southside BBQ sauce. Bite-sized, crispy center-cut St. Louis ribs tossed In Buffalo sauce with celery and bleu cheese. Choice of Barbeque Pulled, Grilled or Crispy Chicken, Texas Beef Brisket or Georgia Chopped Pork. Served on crisp greens with bacon, house-smoked cheddar cheese, tomatoes and shoestring potatoes. Tossed with honey BBQ dressing. Served with a Corn Bread Muffin. Crisp romaine lettuce tossed in Caesar dressing topped with sliced, grilled chicken breast (optional). Served with a Corn Bread Muffin. Choice of Grilled Chicken Breast or Barbeque Pulled Chicken, Tossed with cilantro, cheddar, tomato, roasted corn, black beans, tortilla strips and lime chipotle ranch dressing then drizzled with Rich & Sassy* Served with a Com Bread Muffin. Fresh Garden or Caesar, Served with a Corn Bread Muffin. 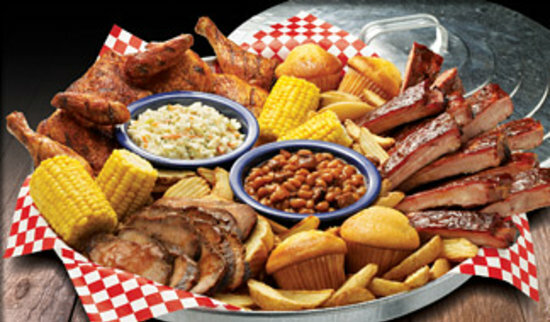 Generous helpings of St. Louis-Style Spareribs, Country-Roasted Chicken, Texas Beef Brisket or Georgia Chopped Pork Creamy Coleslaw, Famous Fries, Wilbur Beans, Sweet Corn and four Corn Bread Muffins. Served family-style for 4-6 people. 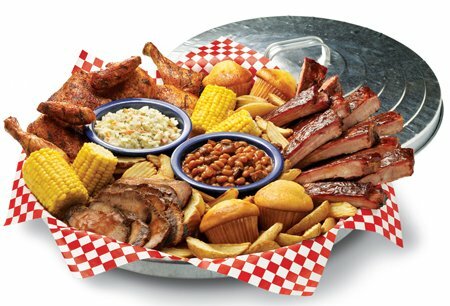 All the flavor of our All-American BBQ Feast* served family-sized for 2-3 people Generous helpings of St. Louis-Style Spareribs, Country-Roasted Chicken, Texas Beef Brisket or Georgia Chopped Pork Creamy Coleslaw, Famous Fries, Wilbur Beans, Sweet Corn and four Corn Bread Muffins. Georgia Chopped Pork, ¼ Country-Roasted or Barbeque Chicken, 3 St. Louis-Style Spareribs, Sweet corn,Wilbur Beans, Creamy Coleslaw, Famous Fries, and a Corn Muffin Bread. Burnt Ends paired with a 1/2 slab of St. Louis-Style Spareribs . 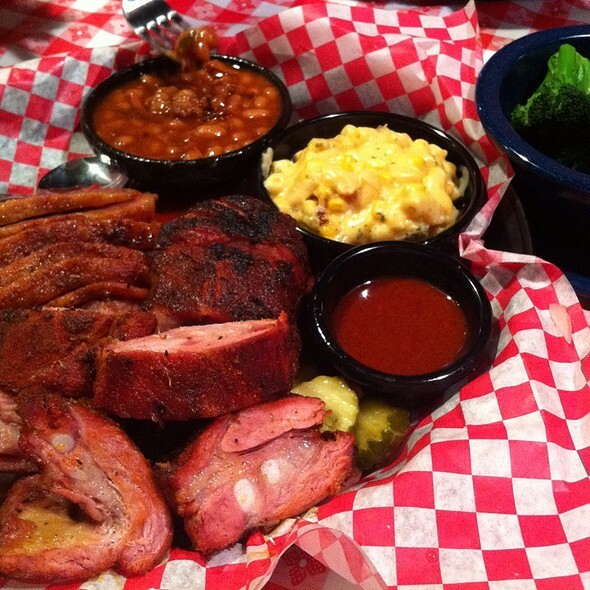 Our award-winning spareribs plus your choice of any one meat selection. A pound of Memphis-style, dry-rubbed tips. Served with a side of jalapeno pickled red onions. Hell-Fire Pickles and our Southside BBQ sauce. Served with choice of two sides and a Corn Bread Muffin. Add a cup of Soup, Chili, Side Salad or Loaded Baked Potato for 3.29. Create your own slab. 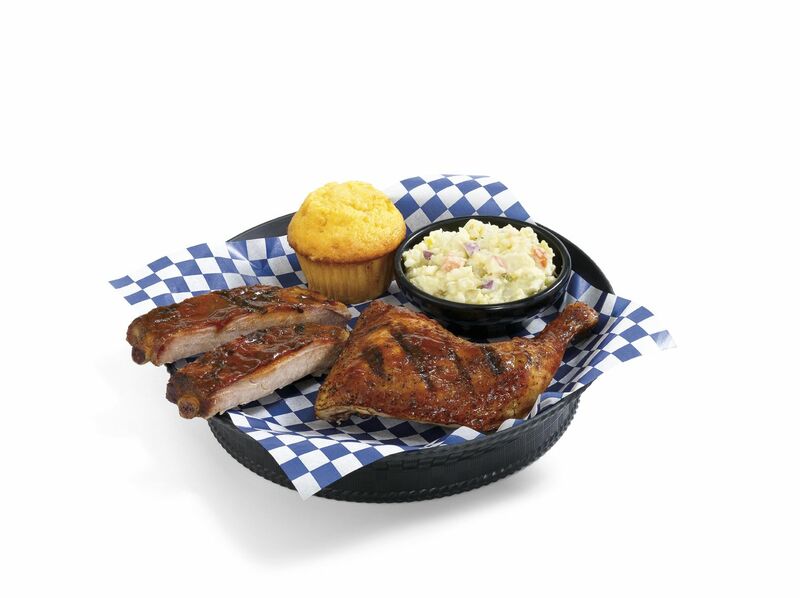 Pair up any two of the following: 1/2 slab St. Louis-Style Spareribs, 1/2 slab Original or Memphis-style Baby Backs. Served with choice of one side and Spicy Hell-Fire Pickles. 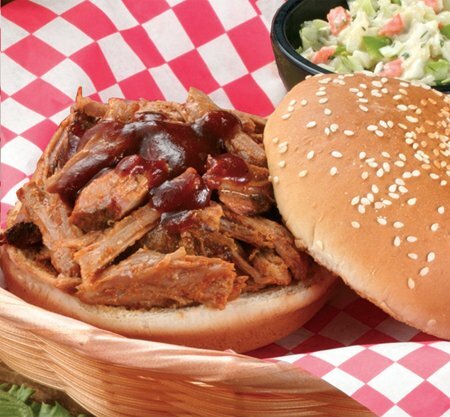 REAL 'QUE SANDWICHES Try it 'Memphis-style and we'll top your 'que sandwich with Creamy Coleslaw! 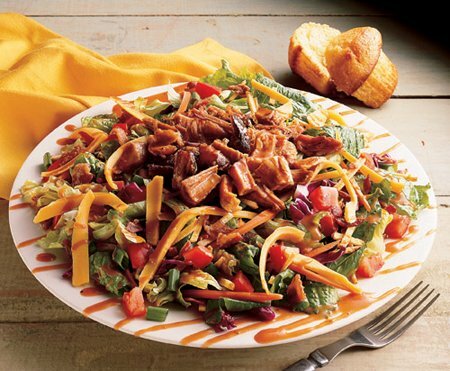 Roasted, pulled chicken tossed in Rich & Sassy* and topped with melted Monterey Jack cheese. Slathered with Rich & Sassy° then, topped with melted Monterey Jack cheese and two strips of bacon. Piled high with Georgia Chopped Pork and two strips of jalapeno bacon, melted sharp American cheese and our signature Beam & Cola BBQ sauce. Simple perfection topped With house-smoked cheddar cheese. Our traditional 100% ground beef burger served with lettuce, tomato and choice of melted Monterey Jack or sharp American cheese. Served 11:00 am. - 4:30 p.m. Served with choice of one side and a Corn Bread Muffin. Served with choice of one side and Corn Bread Muffin. Choose from: Texas Beef Brisket, Barbeque Pulled Chicken or Georgia Chopped Pork with house-smoked cheddar, bacon, sour cream and whipped butter. OR Whipped butter, sour cream, house-smoked cheddar cheese and bacon. Served with choice of one side and corn bread muffin. Tender, fresh broccoli smoked cheddar cheese sauce, bacon, sour cream and whipped butter. Flour tortilla filled with pico de gallo, cilantro and fresh jalapeño with pork and grilled pineapple. Upgrade to: Brisket topped with Jalapeno pickled red onion or Catfish topped with remoulade. 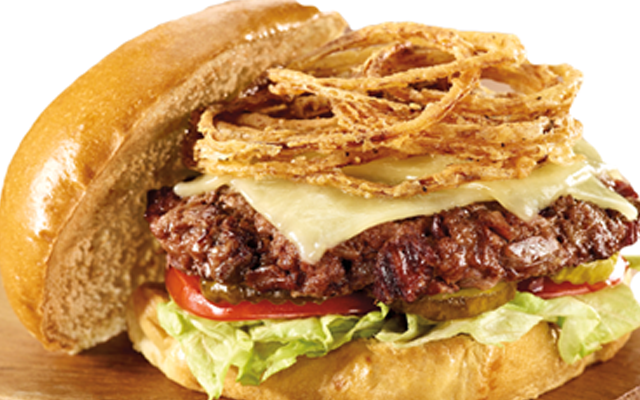 Two quarter-pound, all-beef patties topped with Monterey Jack cheese, bacon, lettuce and tomato with Rich & Sassy. Two quarter-pound, all-beef patties topped with lettuce, tomato and choice of cheese. For kids 10 and under. Includes choice of any one side or carrots and celery, plus Oreo cookies and a milk.